If GUN/Illfonic Make Another Horror Series Game, What Should It Be? 1. Which Horror Series Would You Most Like to Play as a Follow-Up to F13? The one. Who will dance . . . on the floor . . . in the round. Poll above. If your answer is "other", please list it here. Mine, personally, is (just barely) Halloween. Texas Chainsaw Massacre is a VERY close second, and I honestly think that franchise would make for more entertaining (and frightening) gameplay. BUT, I think they should make Halloween first because it has such a larger fanbase, which will translate to the game having more popularity, and popularity = sales. THEN, once they have two great franchise games under their belts, I'd LOVE to see their take on Leatherface's chainsaw and his Texas house. As much as I like Halloween, I think it would be too similar to F13th, in some ways more limited. Michael doesn't run, just silent stalks. There could be some cool suburban and hospital settings but I feel texas chainsaw would be a more tense and frantic setting for a game. It could essential use elements of f13th gameplay. Sawyer farm, slaughterhouse, gas stations, woodlands, it would be very creepy. You could have Dennis hoppers character work in a similar way to tommy jarvis. I think the most similar and easiest code transfers to different objects would be Halloween. I would also love a solid Halloween slasher. You can have the mental hospital from part 1, part 5, and RZ remake, the barn and party house from Part 5, the town area with shops, the graveyard with Judith's grave missing, as well as Haddonfield housing area near the Myers House. Laurie would make an excellent Tommy Jarvis though. I feel as though this is the most possible option, not necessarily what I would choose. TCM would probably be next. Surprisingly, Hatchet would be perfect here. Switch lake to bayou. Add in some recognizable locations, change Jason shack to Crowley Shack. Boats to swamp boats. And they can keep the physics off one of the axes. Movie license is probably real cheap as well. Who should play To.my Jarvis here though? Even though it wouldn't make sense, I would like Tony Todd to. There was a solid gsme of The Thing for original Xbox. I enjoyed the crap out of it. Being the thing and taking over camps wouild be great, but is there only 1 map choice? I'm right there with you. I think we'd all adore to play both a Halloween game AND a TCM game, but I agree that TCM would be much more thrilling and frightening. And I'd like to think the devs could come up with many interesting ways for Halloween to differ greatly from F13. That being said, whenever Michael Myers draws near to you, and that haunting music kicks in, that would be a chilling terror! Again, I'd absolutely love to play both. And we know the holders of both licenses (plus Elm Street) are willing to play ball with the video game industry, as they've already let their characters appear in DbD, so this could really, genuinely happen. My only concern with doing Hatchet is that most would complain it was just a re-skinned F13. Umm.....none. Not trying to start anything, but maybe if a different franchise movie series is made into a game it should be done by a company that has more experience in the gaming industry. Okay, then. Politics aside -- let's say that if you could pick ANY of the games mentioned above to be made, and it was GUARANTEED to be great, which would you choose? Halloween. It would be the ultimate stalk/jump scare game. Could you imagine searching for something and see the white mask slowly show up from a dark corner? Very true. But I think the same about Leatherface's flesh mask jumping out at you, as his chainsaw roars to life. All-in-all, both Halloween and TCM should definitely get their own games. The potential is enormous. Evil Dead! Friday the 13th is already the perfect stalk and survive franchise for that type of game, and as much as I love Halloween as a series (more than Friday the 13th to be honest) I don't see what a Halloween game would have that Friday the 13th doesn't. A Nightmare On Elm Street it has way more easy creative doors for gun to play with!! And could be scary as hell Halloween is good but as s game super 1 track! Add Slumber Party Massacre to the list and I'll vote. I would have to say none. They ruined F13. What started as a horror game has turned into a train wreck disaster. “Friday The 13th: Drawer Simulator Barbie Dress Up Dance Dance Disconnected” should be the title. NOES, it could lead to a killer crossover like Freddy Vs Jason! 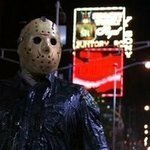 Just an early thought here but; you know how we basically have a predator/prey relationship in F13 with Jason vs. Counselors? I envision it more of a predator vs. predator type scenario. Humans have strength in numbers and sonar/depth charges but each human player has to man their own station. Jaws player would be more maneuverable and have better senses plus be considerably more durable. I see where you're going with it. I'm sure there's a way to do it right. As for the poll, I can't decide between Halloween, Nightmare on Elm Street, and Texas Chainsaw Massacre... All 3 of those would be awesome! All outta likes, love the poll. Texas chainsaw massacre, the sound of the chainsaw roaring while being chased would be great. And then getting dragged back for dinner... Halloween then elm street. Thank you for reading, what killer do you want to have their own game? But i Hope Illfonic and Gun can become more creative and create a Campaign,single player story mode. A Texas Chainsaw Massacre game would be way scarier than a Halloween game.